A parliamentary report of 1777 recorded that Southam had a parish workhouse able to accommodate up to 20 inmates. In 1797, there were 10 paupers in the workhouse. The poor were partly "farmed" by a contractor who received a weekly payment of 2s.9d for each pauper's board and lodging. In 1777, Napton also had a parish workhouse for 20 inmates. Warwickshire: Burton Dassett (2), Chadshunt, Chesterton, Fenny Compton, Gaydon, Harbury or Harberbury (2), Priors Hardwicke, Bishop's Itchington, Long Itchington (2), Ladbrooke, Lighthorne, Prior's Marston (2), Napton-on-the-Hill (2), Upper Shuckburgh, Lower Shuckburgh, Southam (3), Stockton, Ufton, Wormleighton. Later additions (all from 1858): Hodnell, Lower Radbourn, Upper Radbourn, Stoneton, Watergall, Wills Pastures. The population falling within the Union at the 1831 census had been 8,579 with parishes ranging in size from Upper Shuckburgh (population 40) to Southam itself (1,256). The average annual poor-rate expenditure for the period 1834-36 had been £6,615 or 15s.5d. per head of the population. 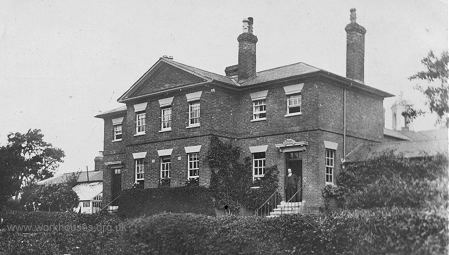 The Southam Board of Guardians held their first meeting on 2nd May 1836 and appointed a committee to instigate the setting up of a new workhouse. On the 9th of May, the committee recommended that the new building be erected on the site of the former House of Industry which was situated to the north-west of Southam on the south side of Welsh Road. On May 31st, the Clerk was instructed to advertise for plans for a workhouse for 180-200 persons. On the 4th July, plans submitted by John Plowman were adopted subject to approval by the Poor Law Commissioners who duly authorised an expenditure of £3,600. Southam workhouse entrance block from the south-east, c.1910. 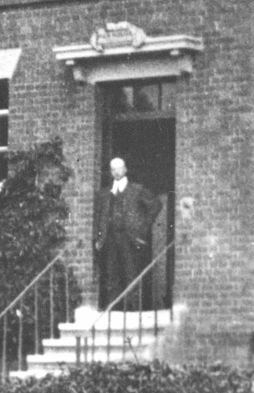 Could the figure at the doorway be the then workhouse master, or perhaps the porter? Southam workhouse entrance block detail, c.1910. After 1912, the workhouse became officially known as the Southam Poor Law Institution. In 1923, the Rural District Council accepted a tender of £1,240 from FG Watson of Southam for converting the building into dwellings. Southam Primary School now stands on the site. Southam former workhouse site, 2000. Warwickshire County Record Office, Priory Park, Cape Road, Warwick CV34 4JS. Very few records survive, the main holdings being Guardians' minute books and accounts (1836-1930).